Clean and minimal site for a Philadelphia nonprofit jazz and experimental music presenting organization. 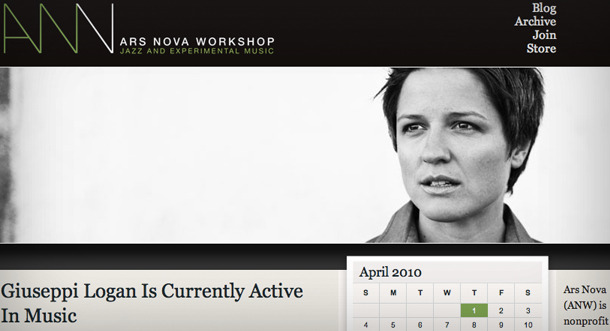 Ars Nova Workshop had outgrown their early static html site and needed a site that allowed them to much more easily spread the word about the unique Jazz and Avant-Garde events they promote in Philadelphia. They also wanted the ability to easily turn their calendar of events into a rich database of musical history with streaming audio and video, and to create an online store to support their new music label. Canary created a sleek design that matched the artistic identity of the organization, and incorporated all of their desired features gracefully into that design. Features include a cross-fading slide show of images on the home page, streaming audio from nearly every artist, and a sharp attention to the small details of typography, color and space that help set the tone and guide users deeper into the site.